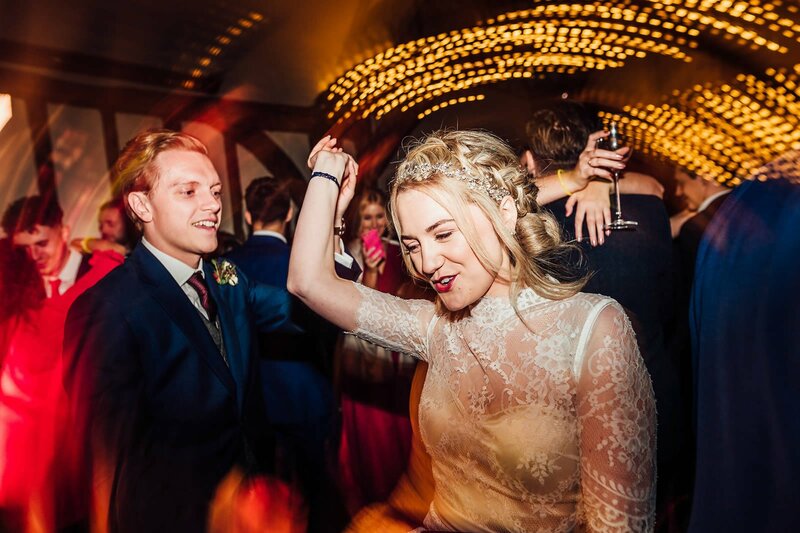 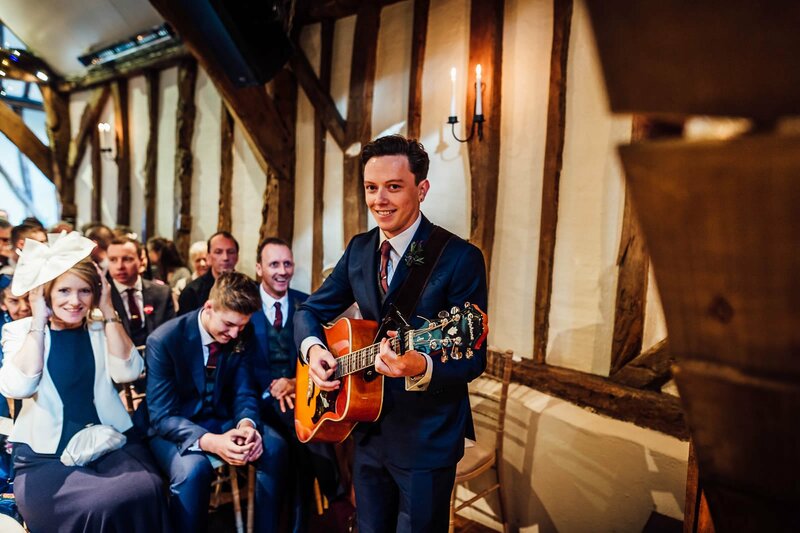 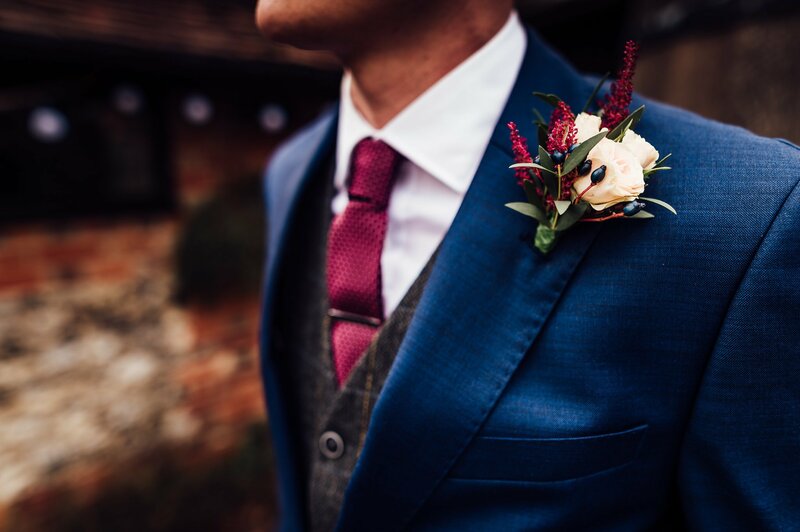 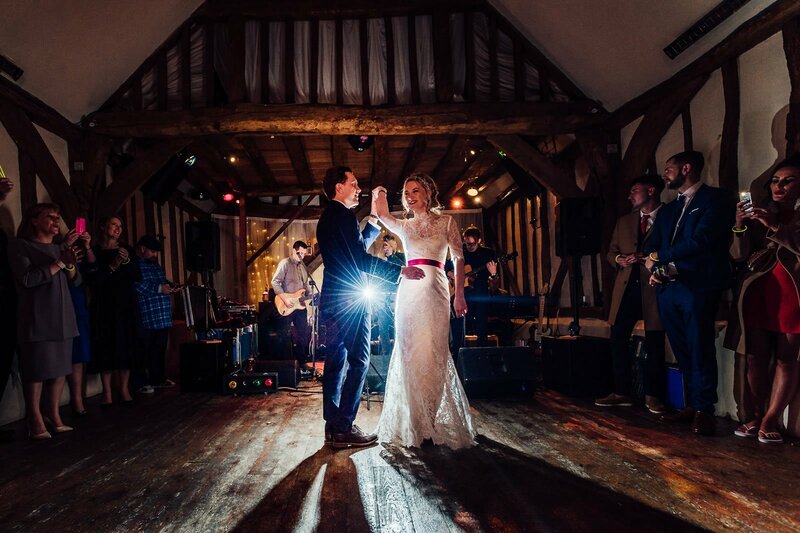 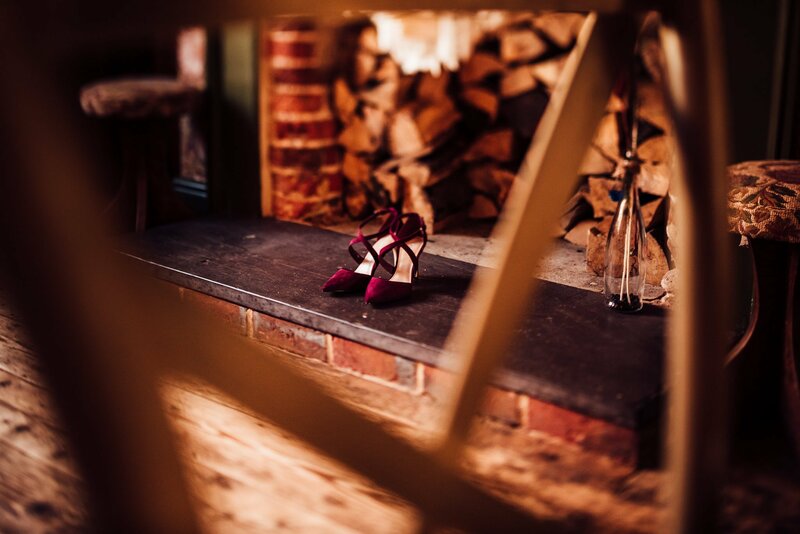 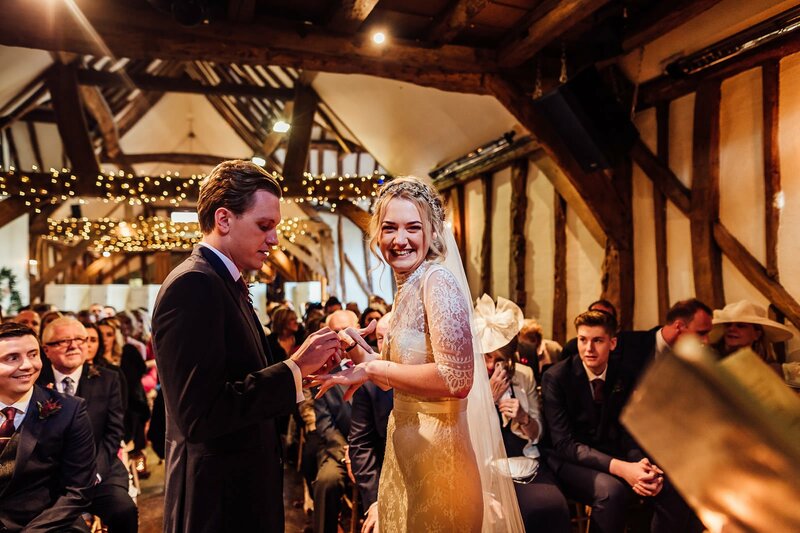 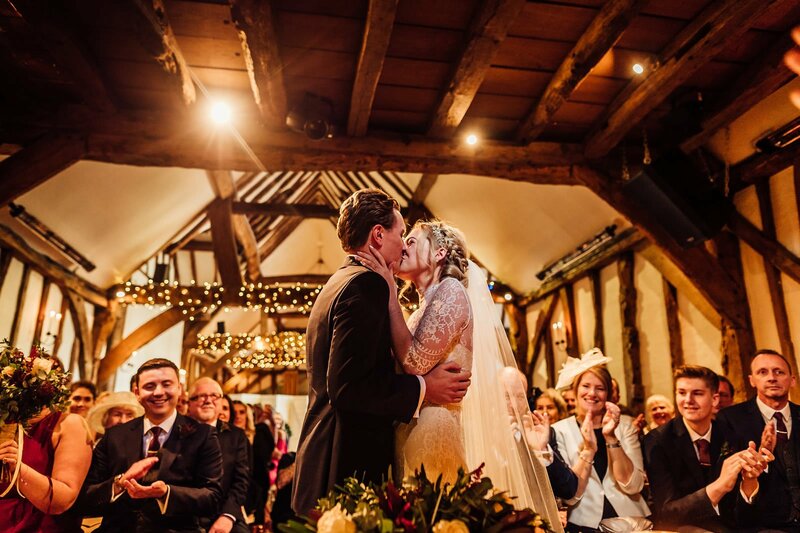 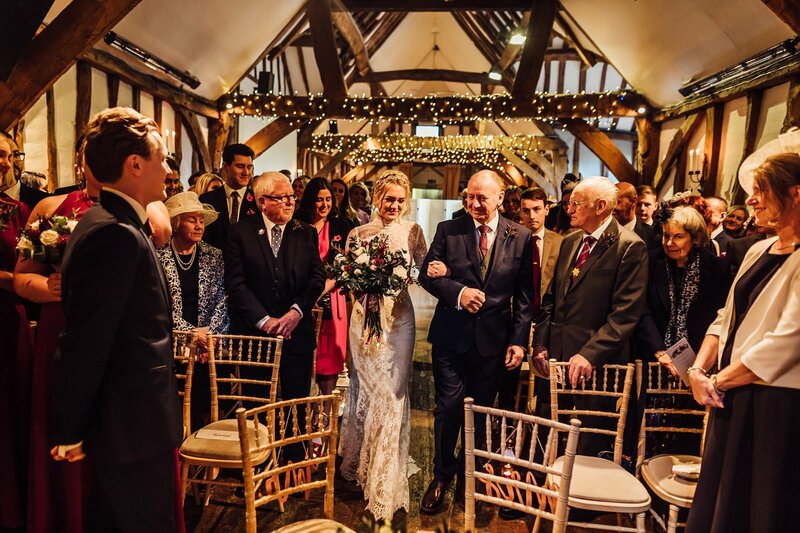 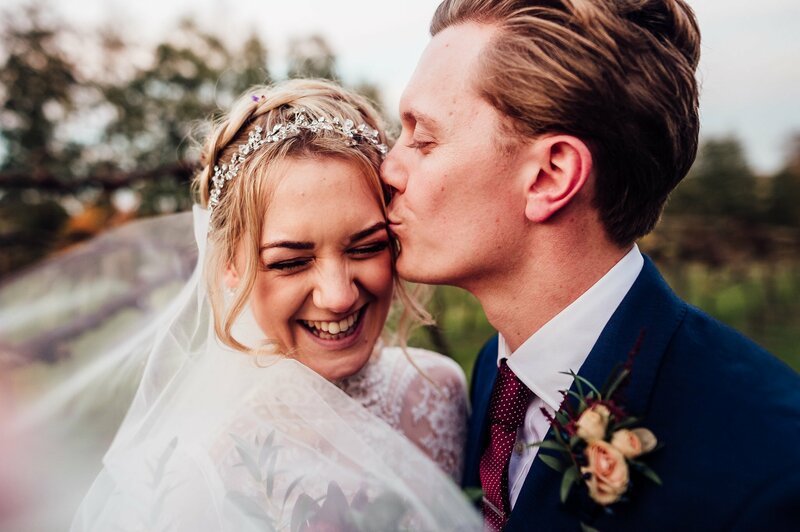 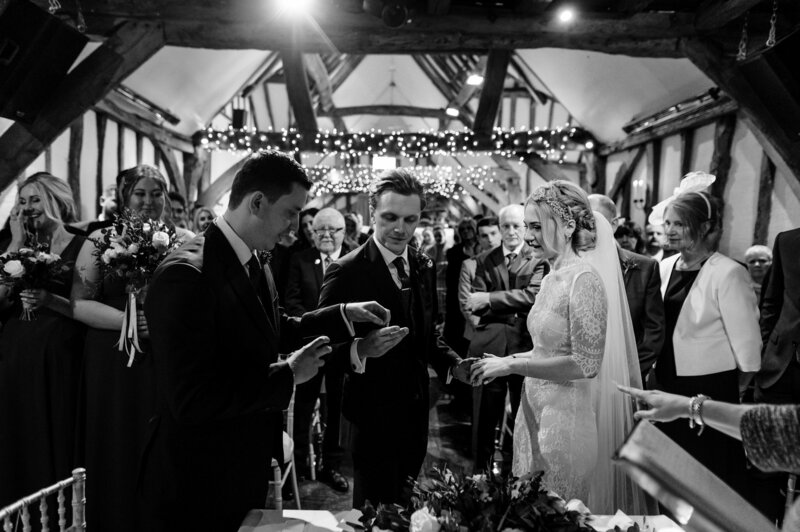 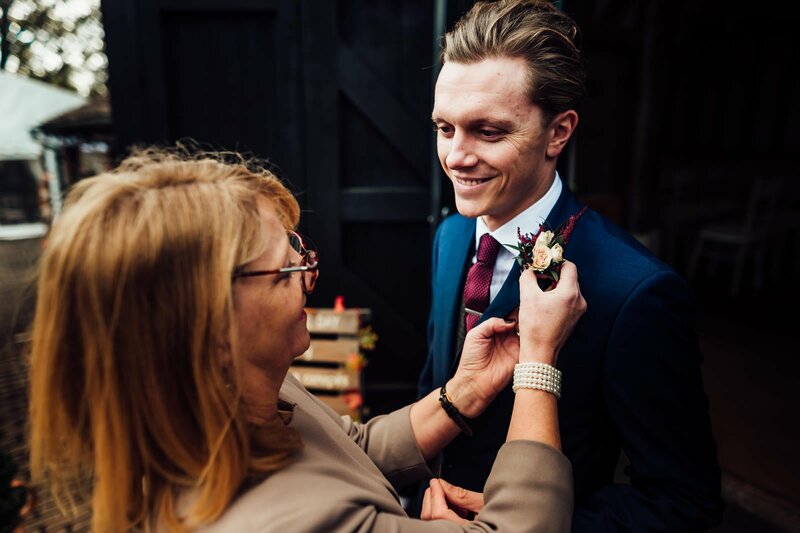 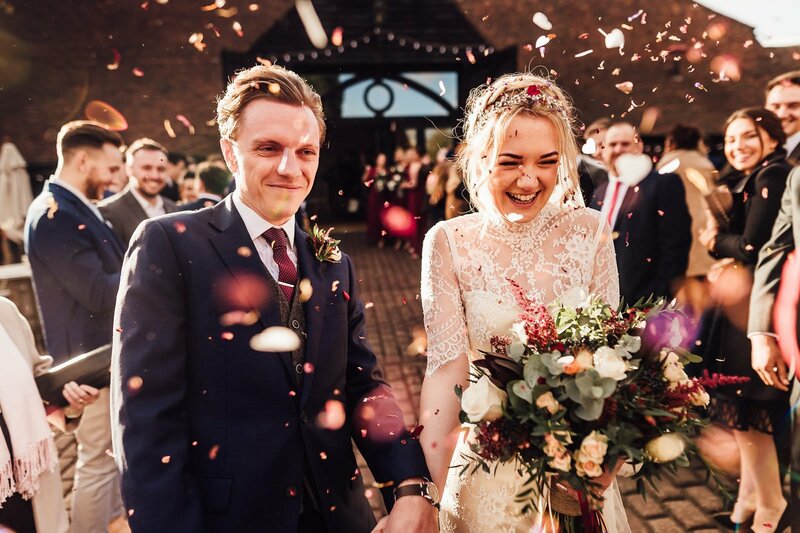 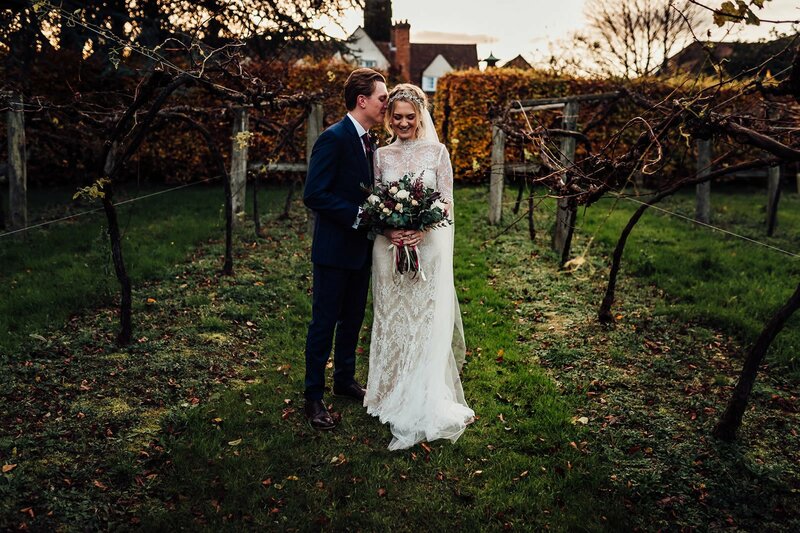 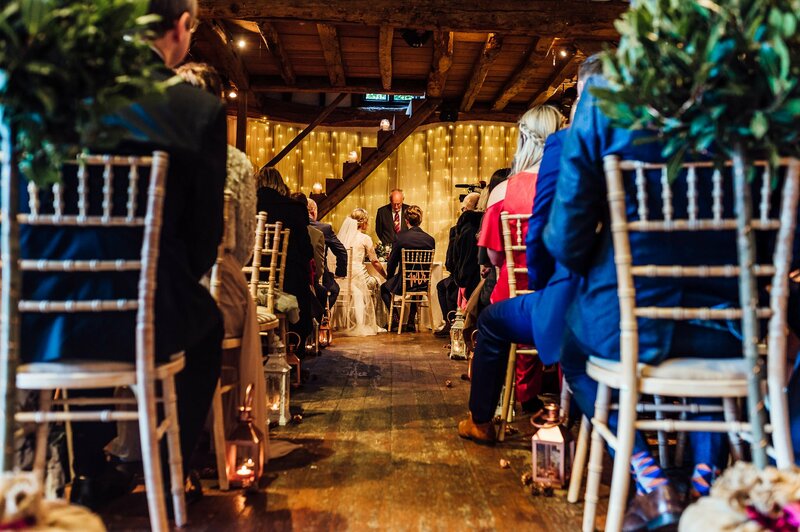 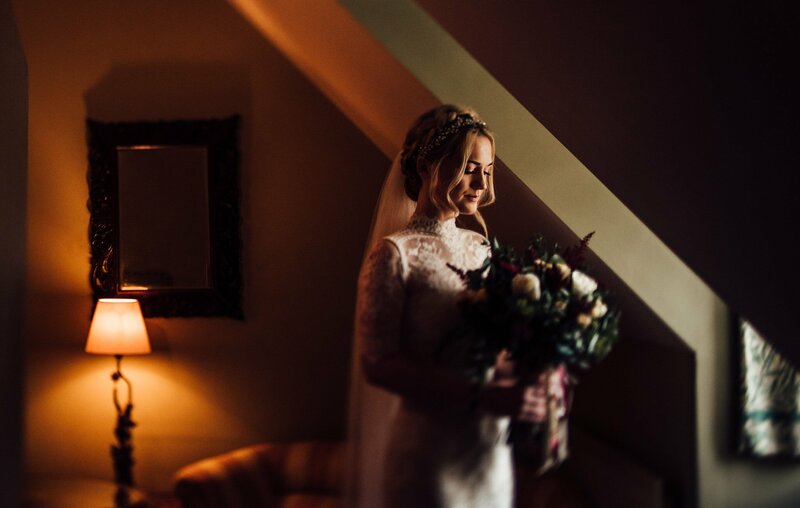 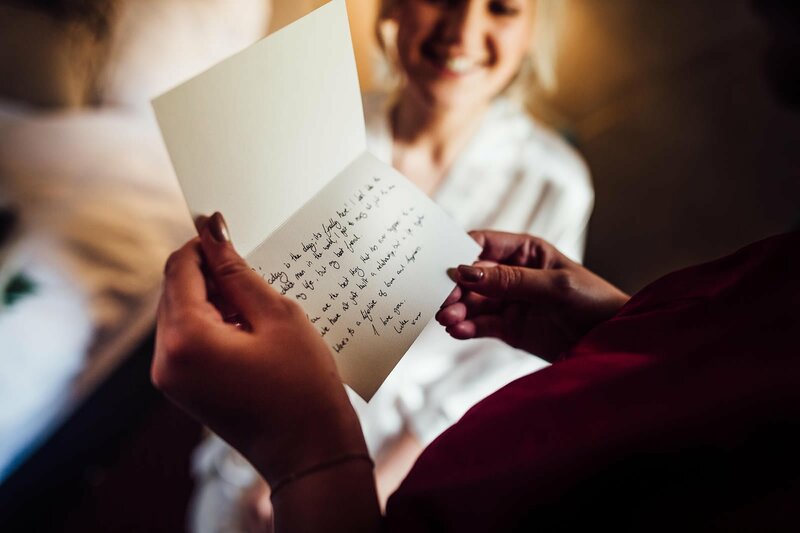 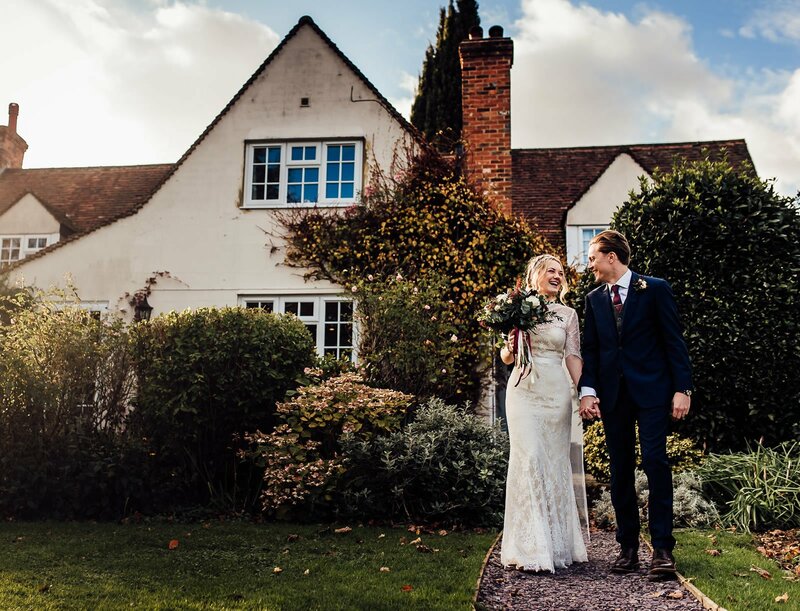 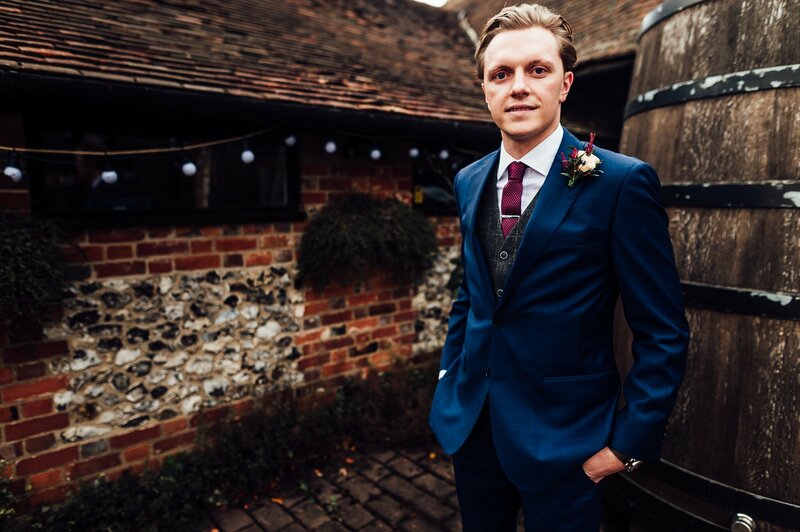 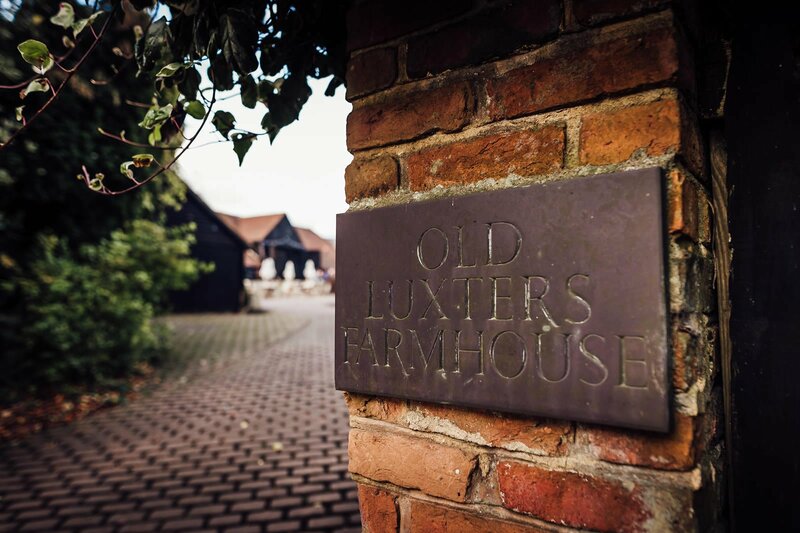 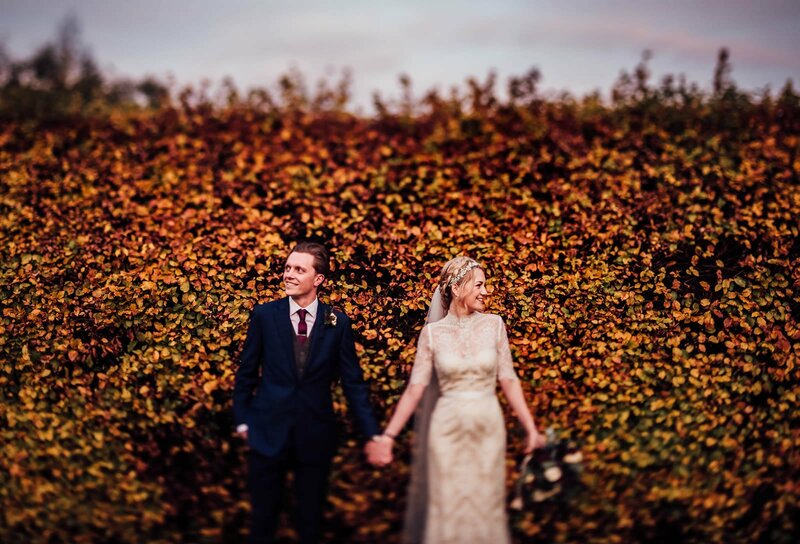 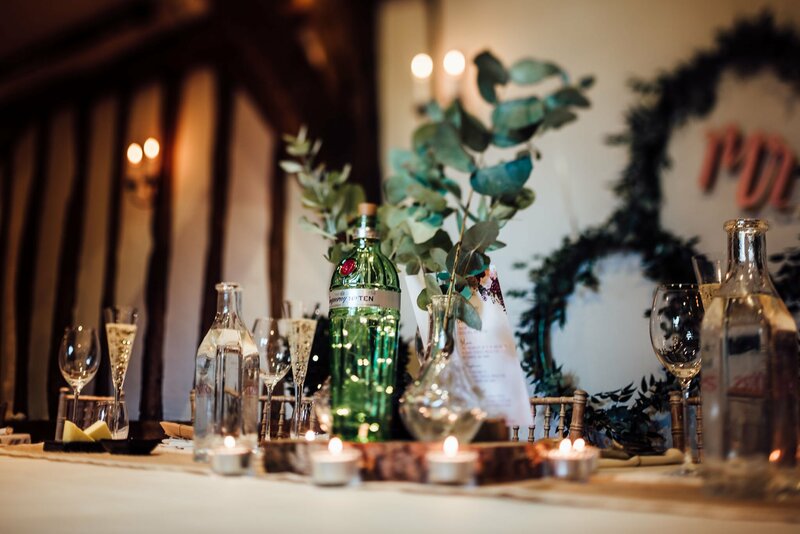 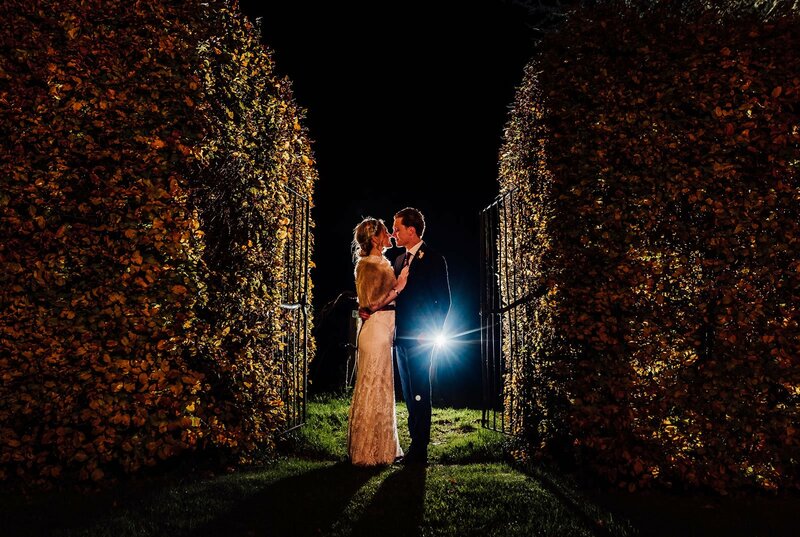 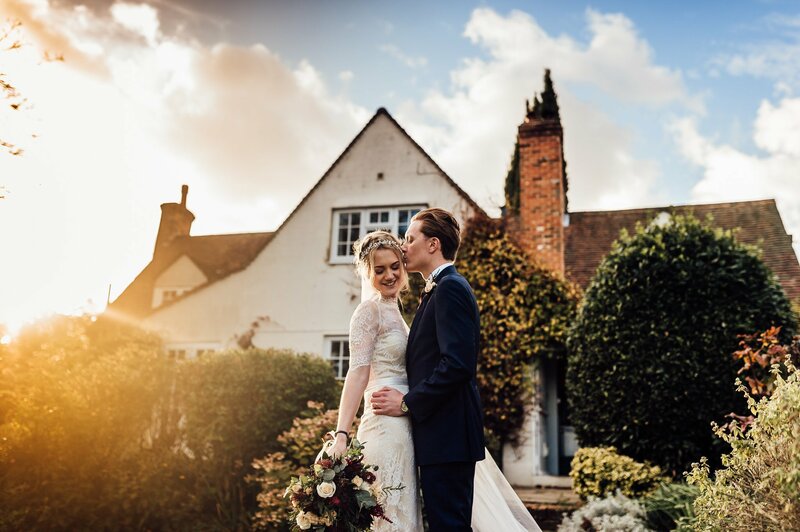 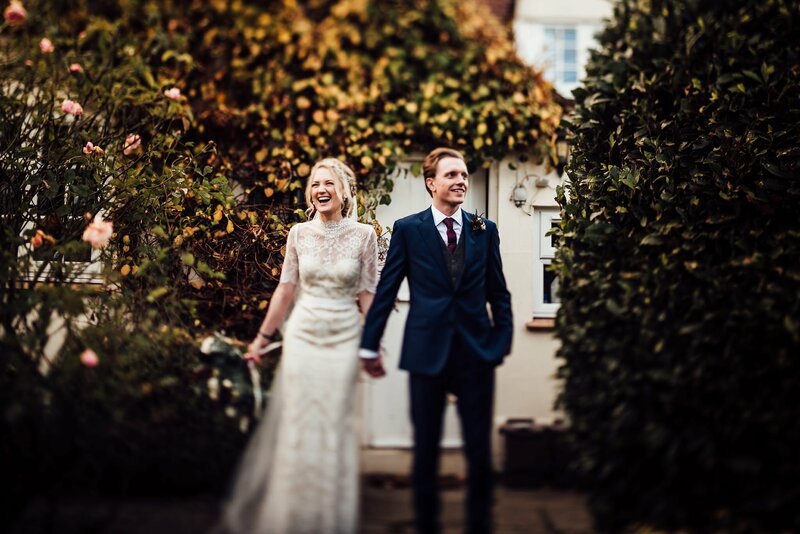 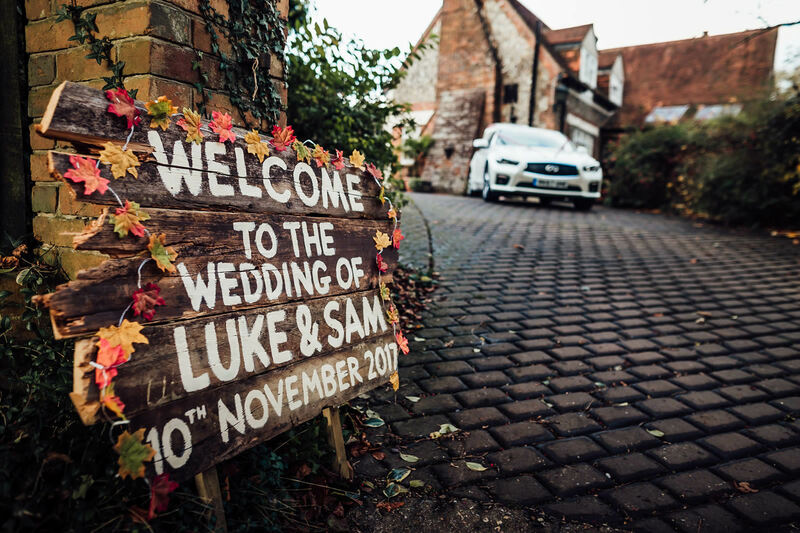 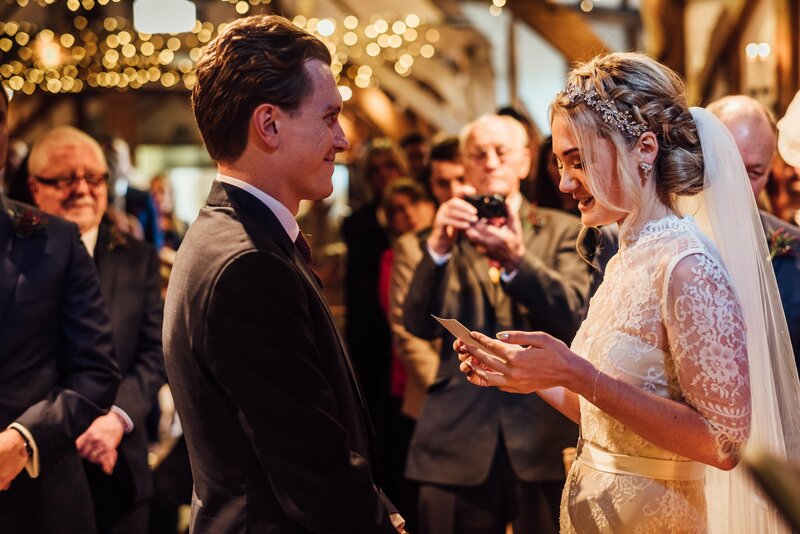 Luke and Samantha got married at Oxfordshire’s stunning Old Luxters Barn Wedding Venue. 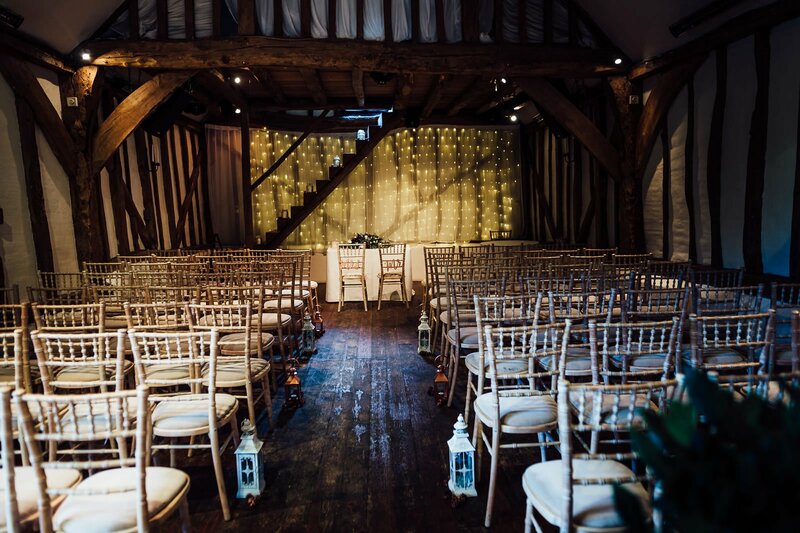 Part of Chiltern Valley Winery, Brewery & Vineyard, the 18th barn made for a breathtaking wintery setting. 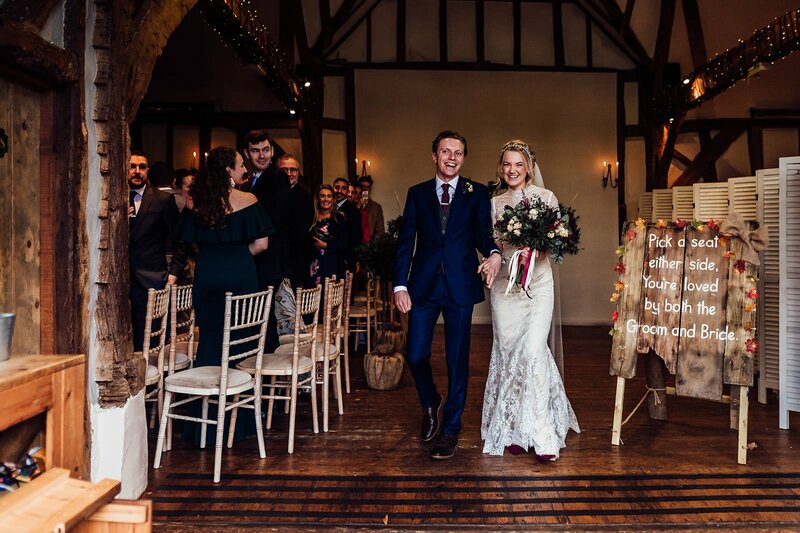 It was the most perfect barn wedding venue for Luke and Samantha’s beautiful day. 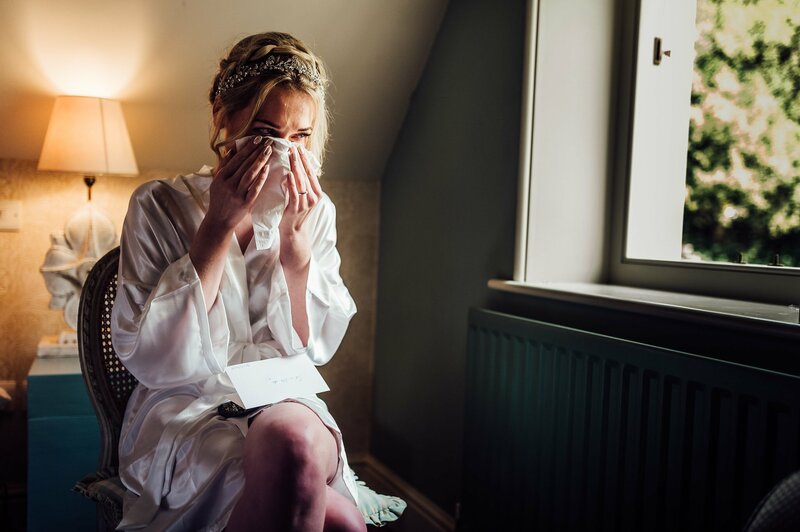 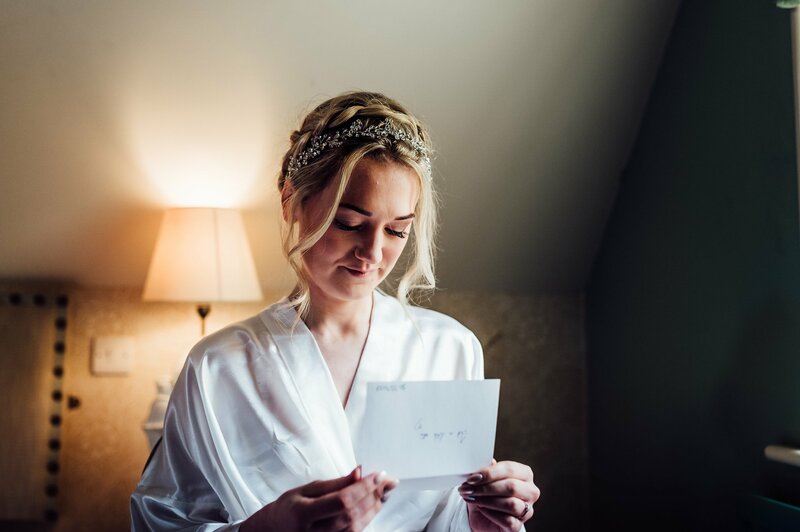 Samantha got ready at The Stag & Huntsman Hotel nearby. 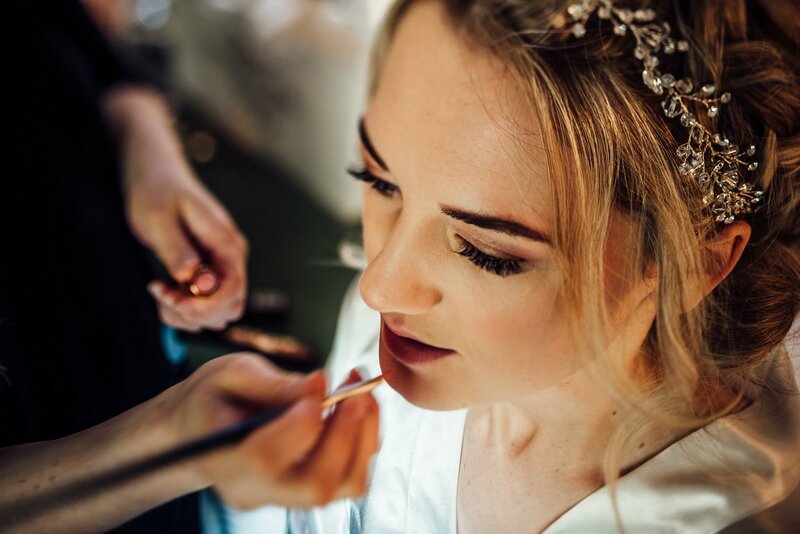 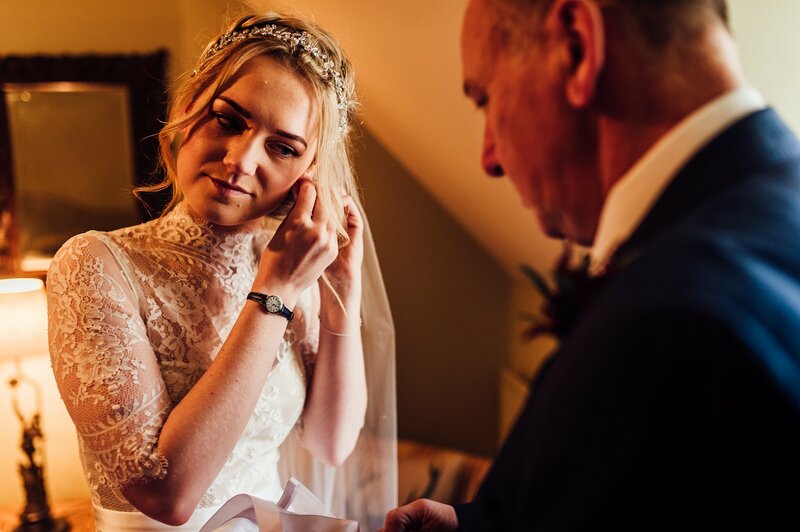 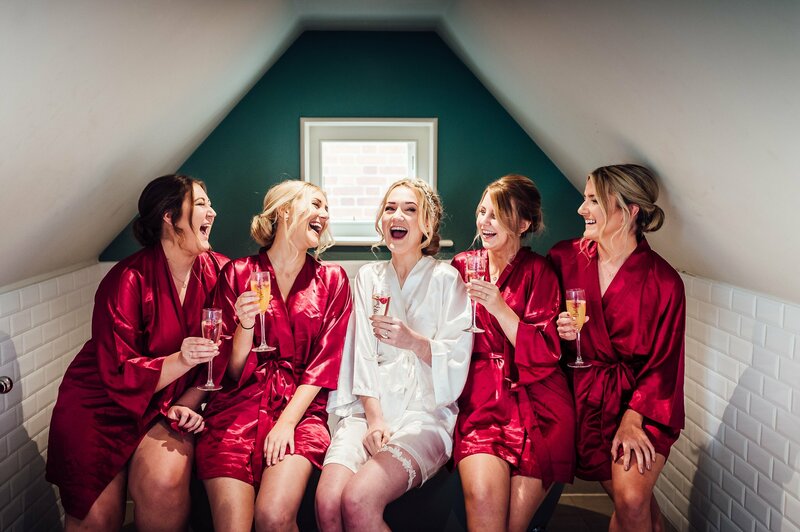 I arrived to see Frankie from Oxford Wedding Hair & Make Up applying the finishing touches to Samantha and her bridal party. 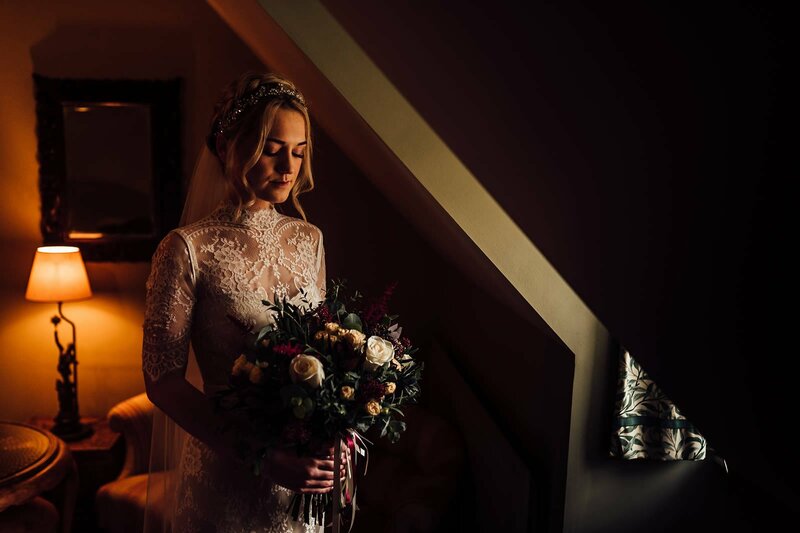 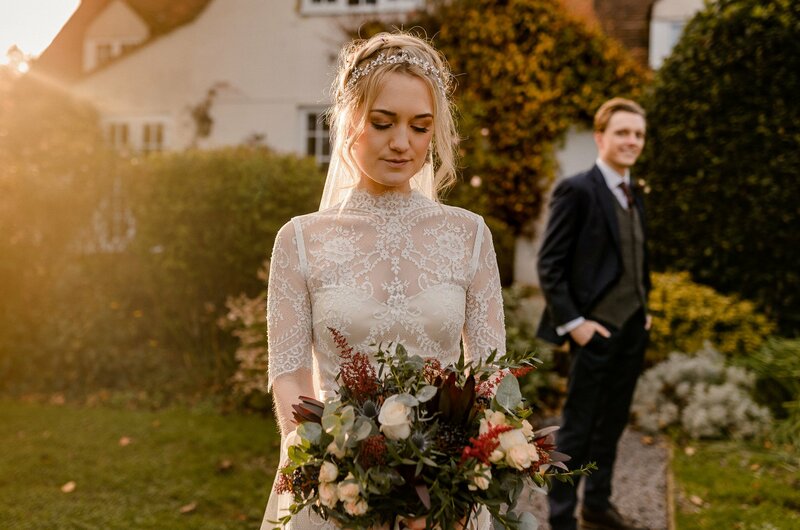 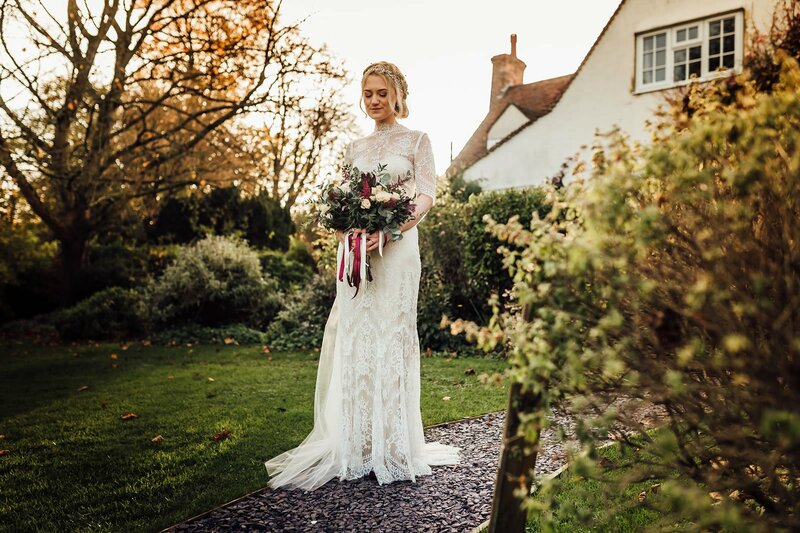 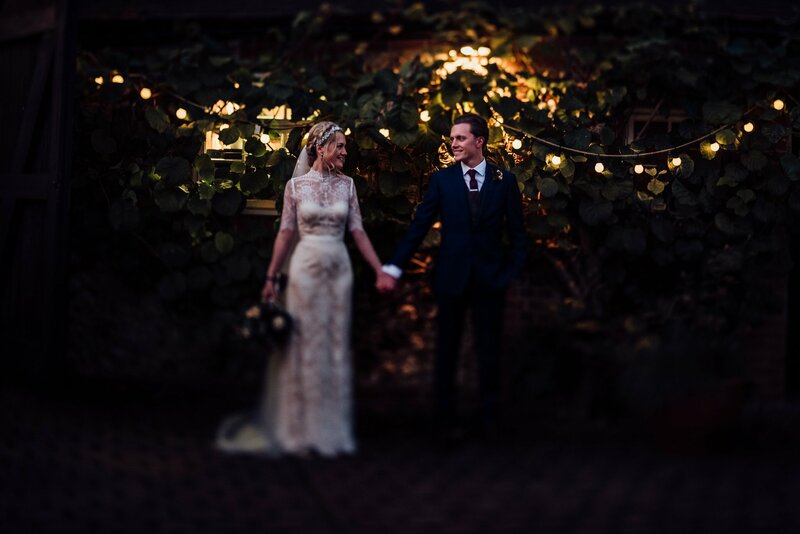 Samantha wore a lace, vintage style gown by Catherine Dean. 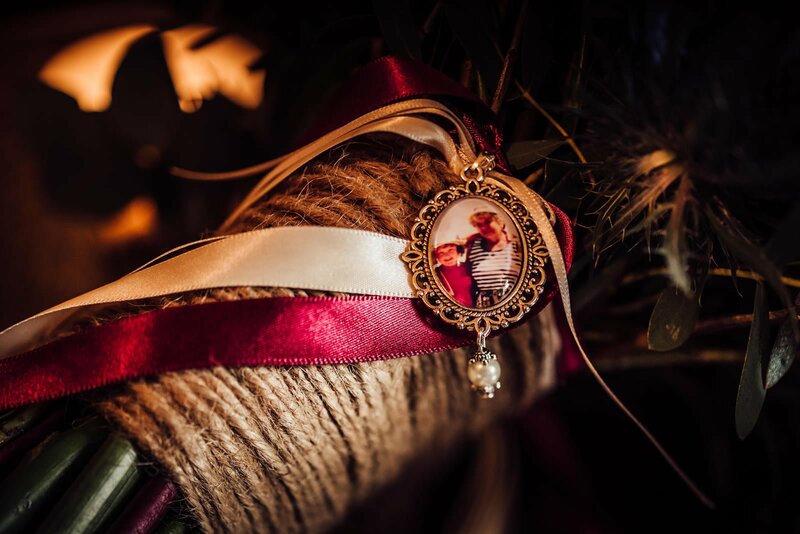 A Vintage Floral Boutique bouquet with a pendant of photos attached. 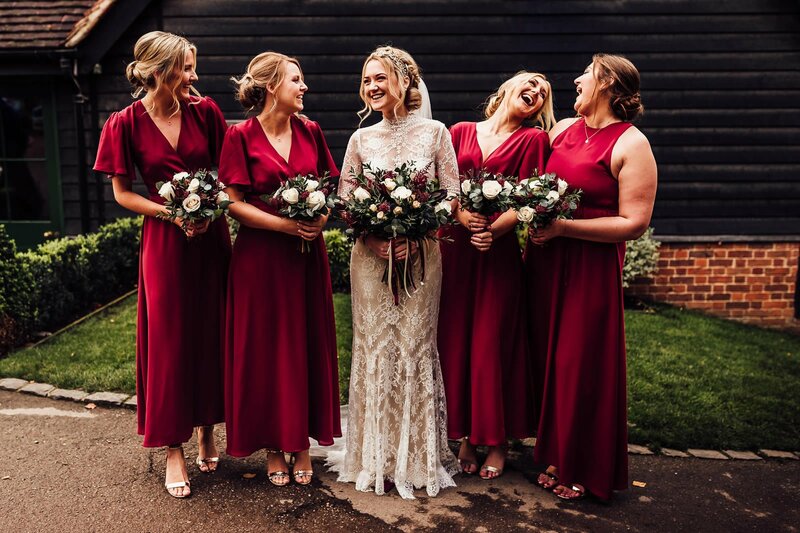 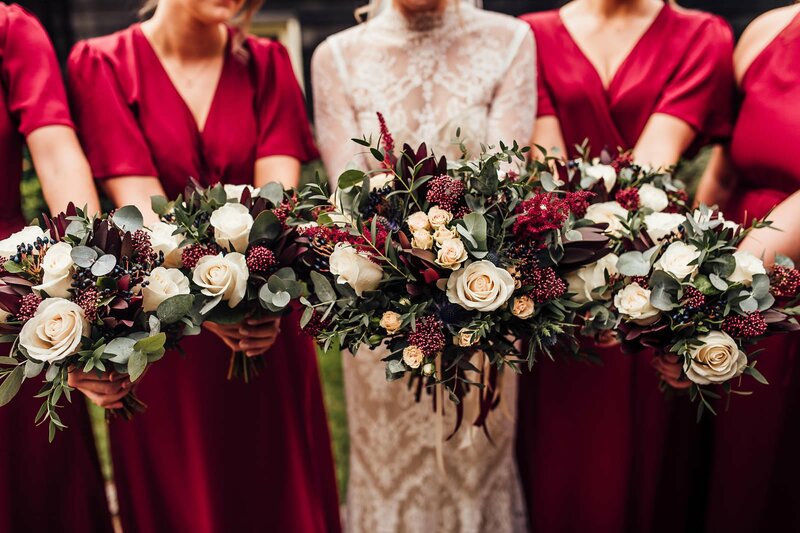 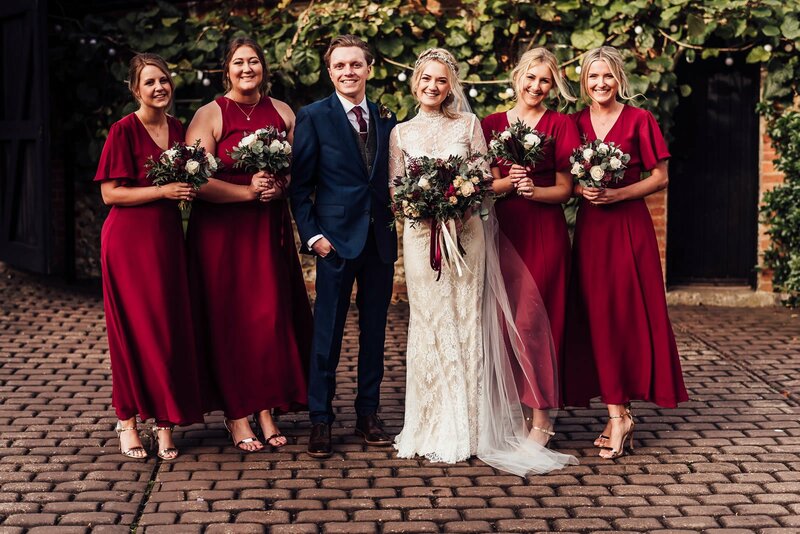 She looked absolutely beautiful, as did her lovely bridesmaids in their deep crimson gowns. 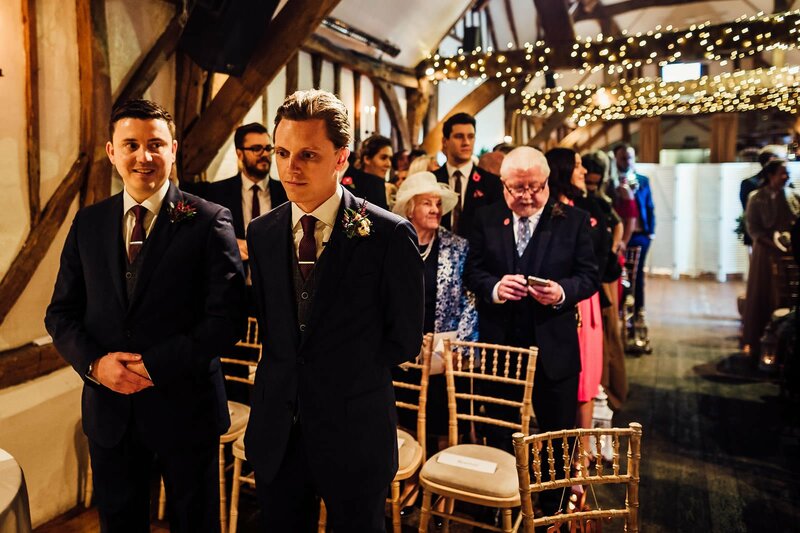 Meanwhile, Luke and his groomsmen suited up at the Paddock B&B before heading to venue ahead of the bridal party. 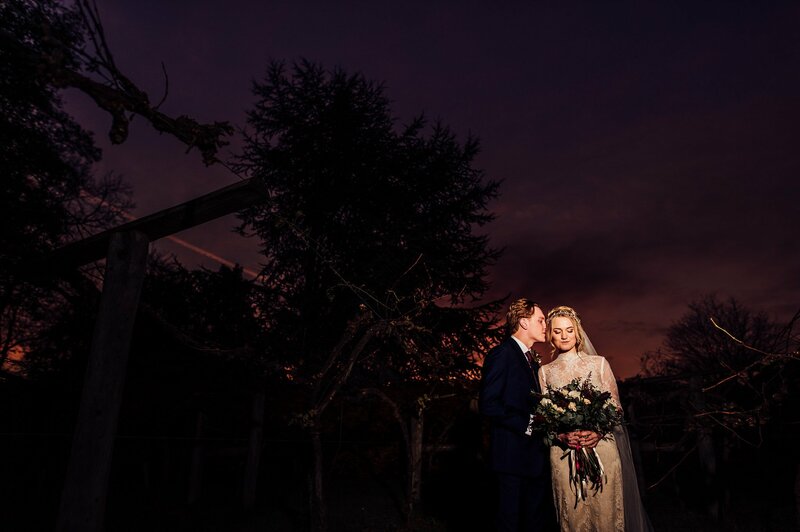 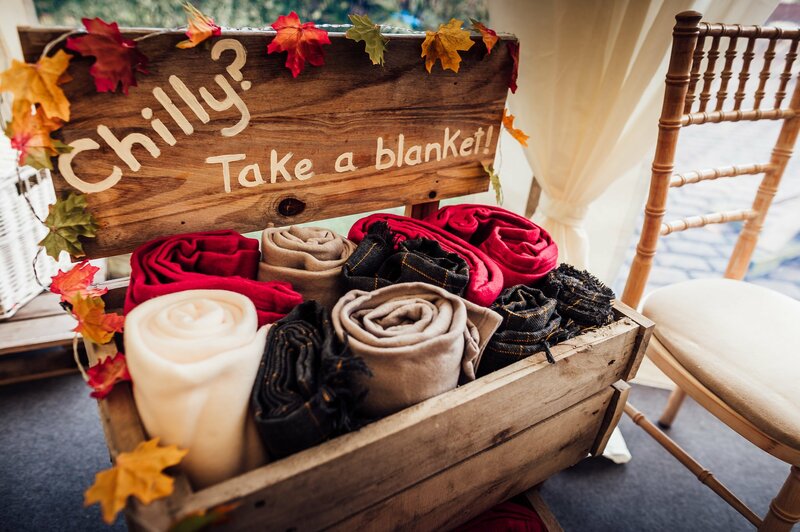 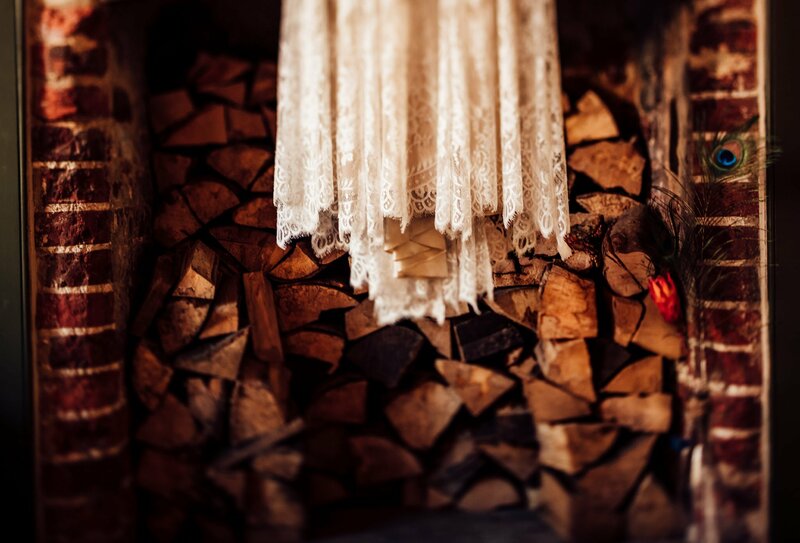 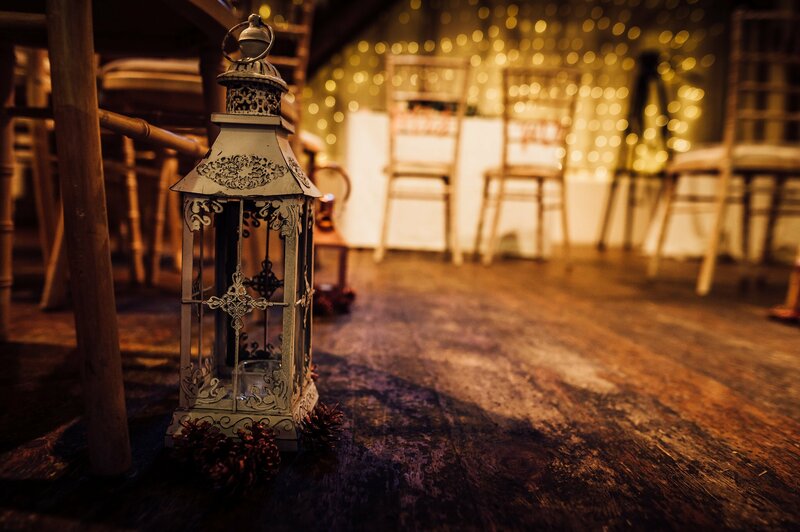 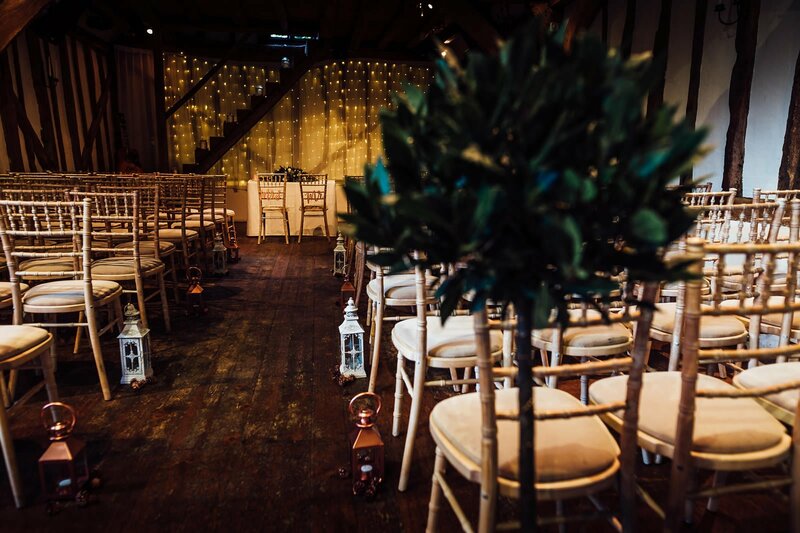 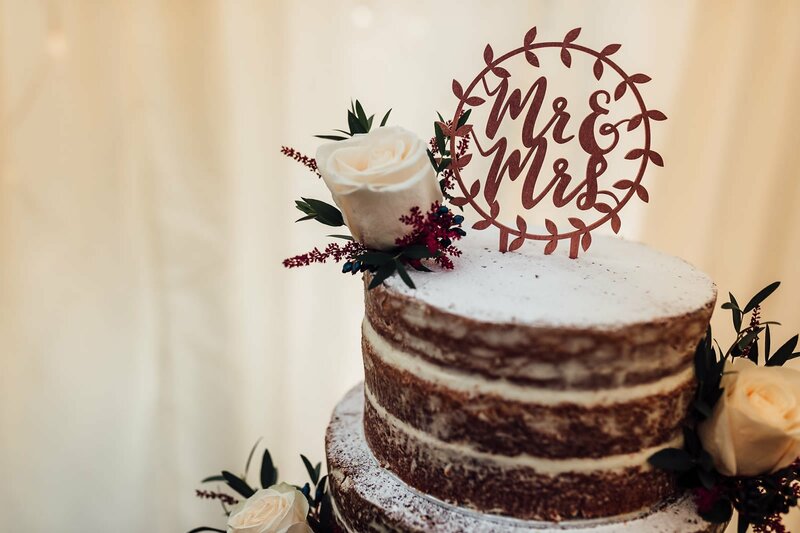 Old Luxters Barn Wedding Venue was beautifully decorated in the couple’s vintage aesthetic and the beautiful winter weather provided the perfect soft lighting for romantic and timeless photos. 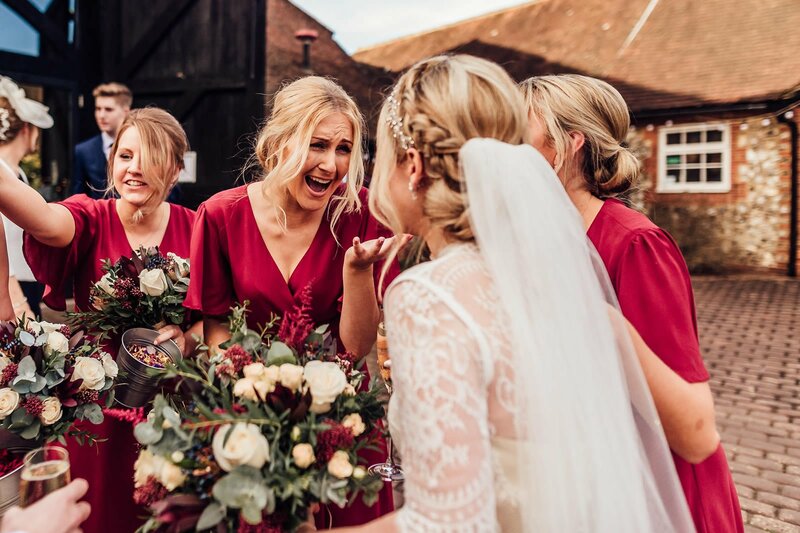 The deep red accents around the venue provided an almost festive air of happiness. 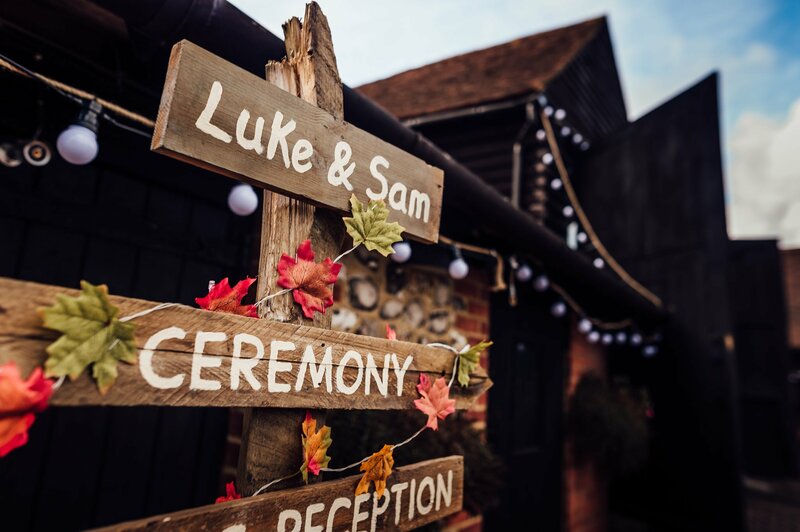 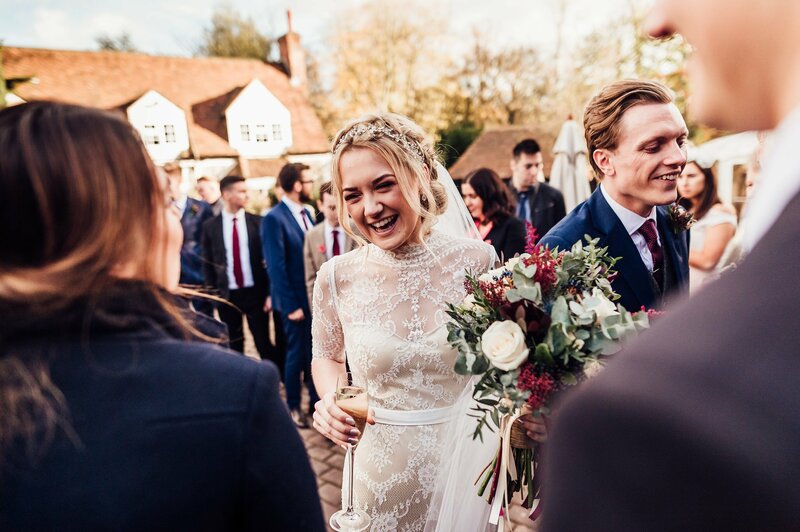 After the ceremony, Samantha and Luke celebrated with their friends and family. 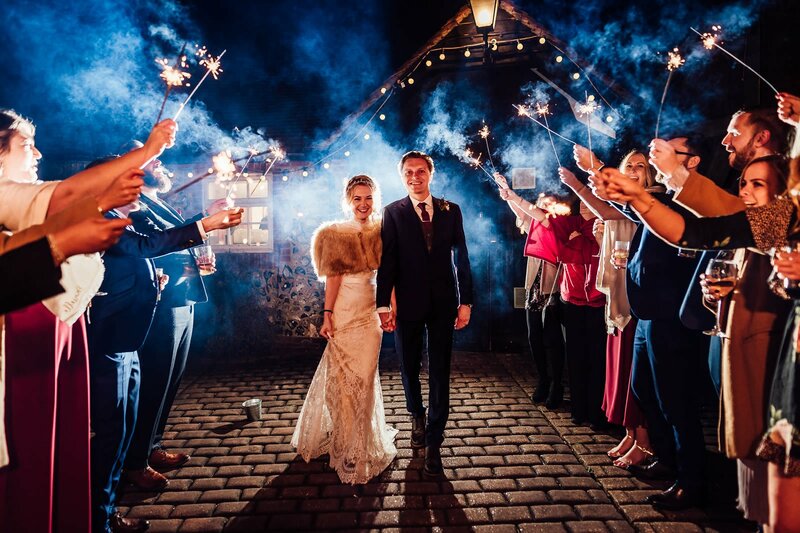 Old Luxters Barn’s gorgeous courtyard made a perfect backdrop for sparkler photos before a night of merriment ensued! 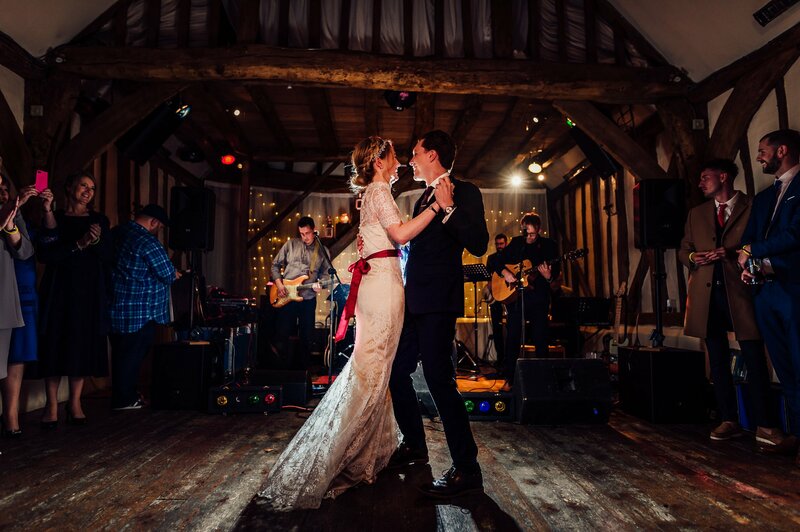 I slipped away after the couple shared their first dance as husband and wife. 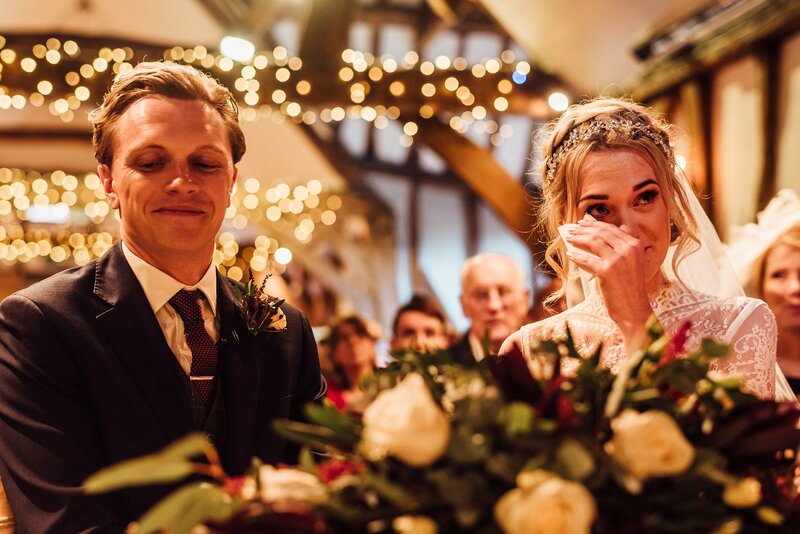 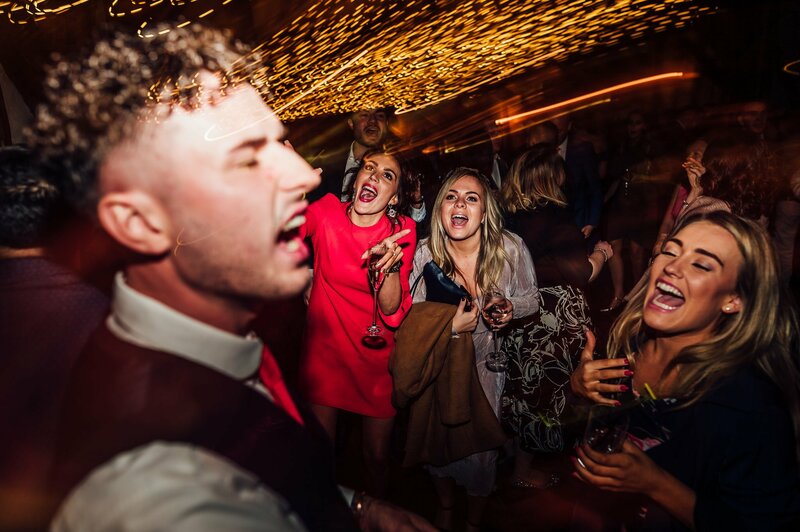 What a beautiful wedding full of love and emotion. 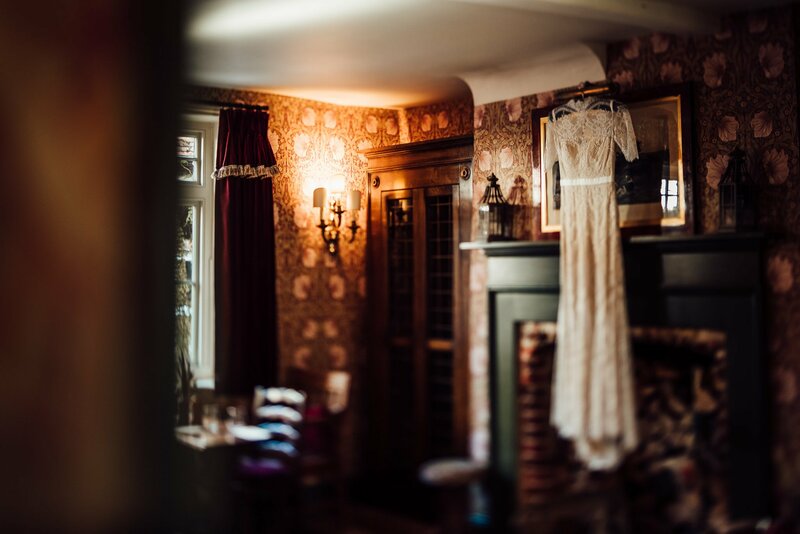 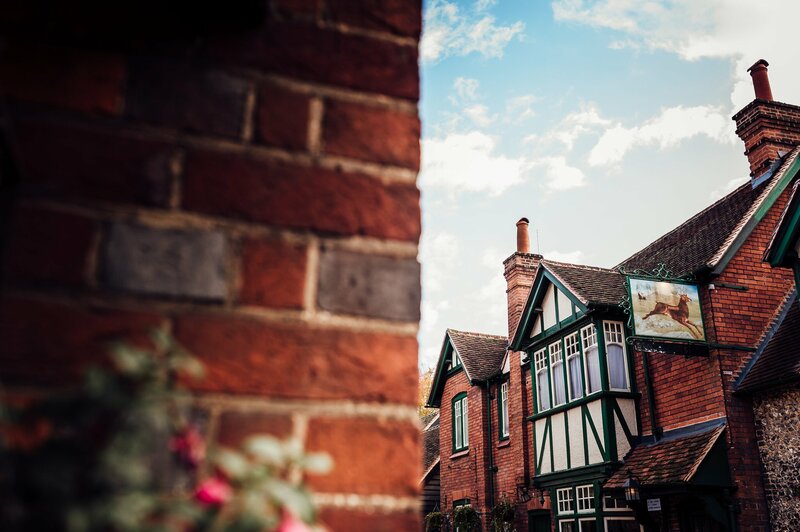 A timeless and classic wedding venue. 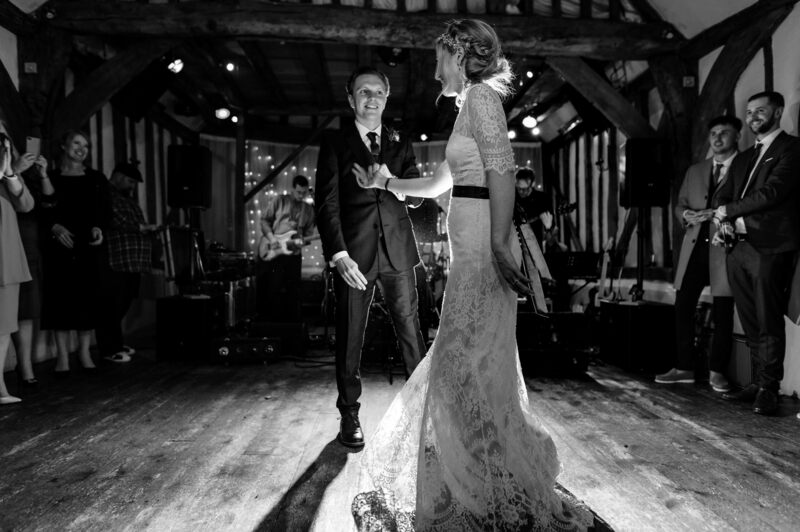 An authentic and warm couple and some incredibly emotive images . 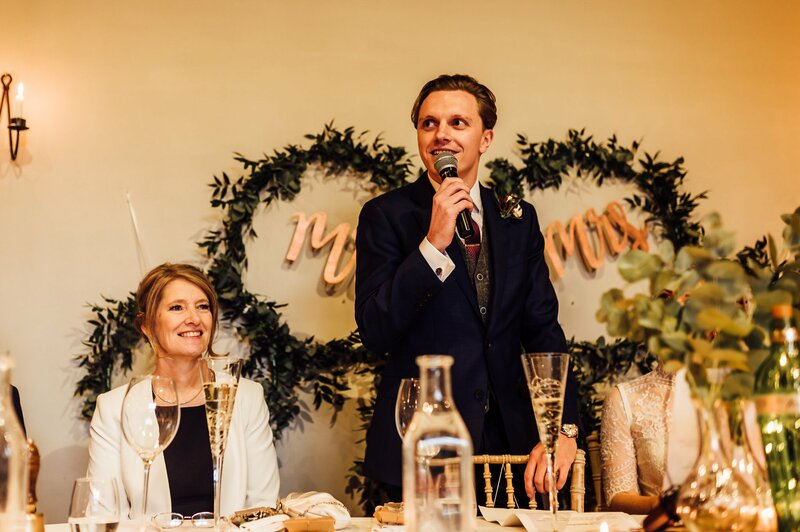 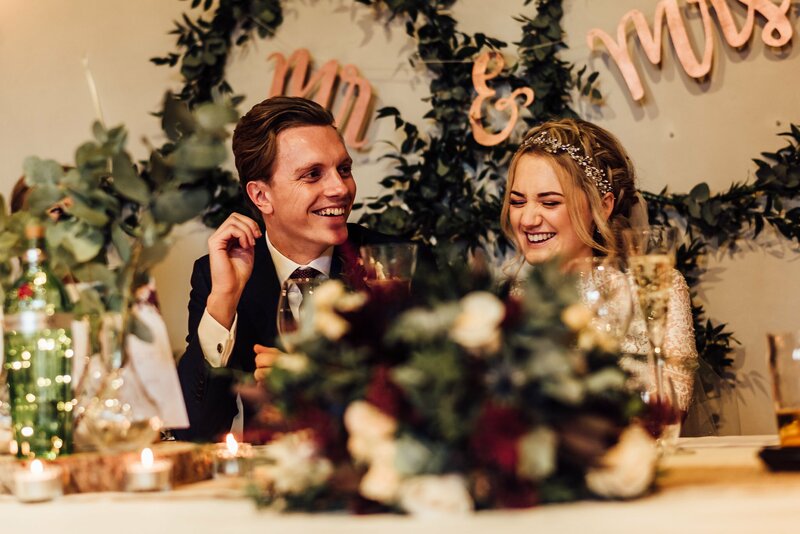 One of my favourite winter weddings and an absolute of 2017.